Unit: 2nd Battalion, 113th Infantry Regiment, 50th Brigade Combat Team, Riverdale, N.J.
Staff Sgt. 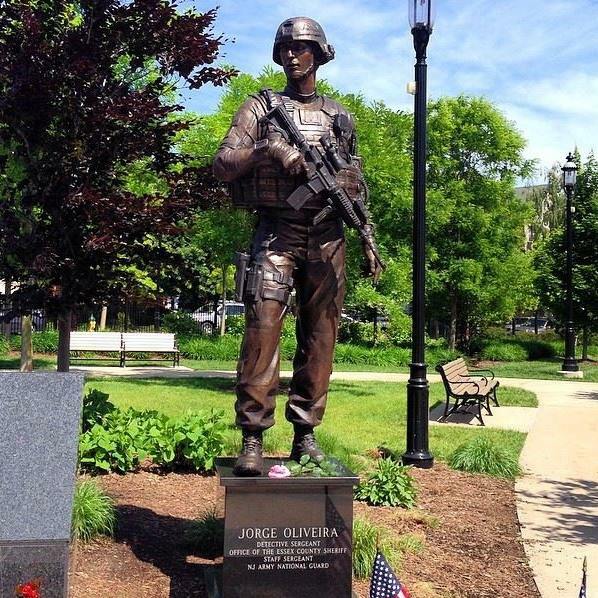 Jorge M. Oliveira died at Yahya Khel, Paktika Province, Afghanistan when insurgents attacked his unit with an improvised explosive device. The Soldier was dismounted and conducting a route reconnaissance when the explosive device detonated. 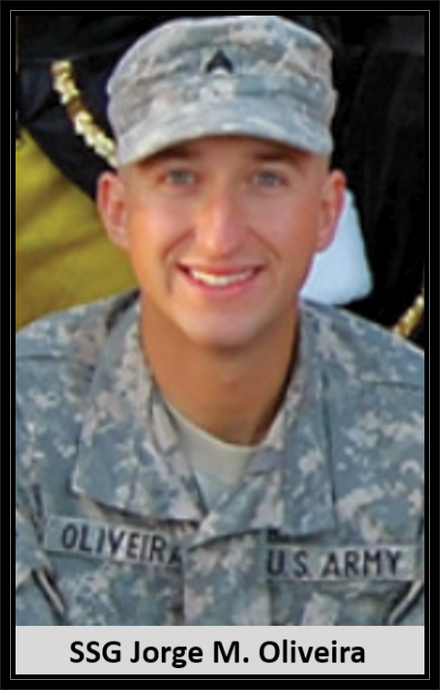 Oliveira spent three years on Army active duty with the 101st Airborne Division before joining the National Guard in 2003. In Afghanistan, Oliveira's unit is assigned to the Sharana Provincial Reconstruction Team (PRT), which is assisting the Afghan government establish the rule of law and sustainable economic and social development in the region. In April, Maj. Gen. Glenn K. Rieth, the New Jersey Adjutant General, met Oliveira and other members of the unit during their training at Camp Atterbury, Ind. Rieth said Oliveira was one of the most seasoned noncommissioned officers on the deployment, having served on a detainee operations mission to Guantanamo Bay, Cuba in 2004, in response to Hurricane Katrina in New Orleans the following year and a yearlong combat tour in Iraq with the 50th Infantry Brigade Combat Team in 2008-2009. Oliveira had recorded a litany of achievements in his time in uniform. He had been awarded the Expert Infantry Badge; the Air Assault Badge; the Airborne Badge; and the Army Military Mountaineer Badge. He had completed the Primary Leadership Development Course; the Infantry Light Leader's Course; and the Combat Tracker Course and the winter in Fort Huachuca, Arizona. Oliveira was awarded the Army Military Mountaineer badge in early 2011 for completing the winter phase of the Mountaineering Course in Jericho, Vermont. In March of 2011, Oliveira along with the other members of the 2nd Battalion 113th Infantry Security Forces Platoon entered the mobilization phase of their deployment in Camp Atterbury, Indiana. Upon completing mobilization training, Oliveira with the other members of his platoon deployed to Afghanistan in June 2011 where he served as a Squad Leader in a Security Forces Platoon attached to the Provincial Reconstruction Team. Staff Sgt. 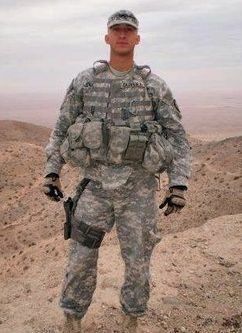 Jorge M. Oliveira, 33, of Newark, N.J., died Oct. 19 in Paktika province, Afghanistan, of wounds suffered when insurgents attacked his unit with an improvised explosive device. He was assigned to the 2nd Battalion, 113th Infantry Regiment, 50th Brigade Combat Team, Riverdale, N.J. Staff Sgt. Oliveira was on his third, year-long tour of duty during the incident. He previously served in Iraq and Cuba. When not in fatigues, Oliveira worked as an Essex County Sheriff's officer. His boss praised his 11-year service to the department. He joined the Sheriff 's Office in 2001, served as a member of the SWAT team & warrant squad, and most recently a detective with the fugitive squad. He is survived by his parents Mrs. Armanda Nunes Oliveira (nee DosSantos) and Manuel Moreira DeOliveira. Brother of Marco & Jessica Oliveira. Essex County Sheriff's officer Jorge Oliveira, 33, of Newark, left, was on his third tour of duty when he was killed, according to Sheriff Armando Fontoura. Oliveira is seen here in a February 2008 photo when he received a teamwork award. Credit Contributed photo. A veteran Essex County Sheriff's officer serving in Afghanistan with the New Jersey Army National Guard was killed Wednesday, Sheriff Armando Fontoura said Thursday afternoon. Staff Sgt. Jorge Oliveira, 33, of Newark, was on his third, year-long tour of duty during the incident. He previously served in Iraq and Cuba, according to Fontoura. When contacted by phone, officials with the National Guard did not confirm the death or release details about the incident. A spokesman with the sheriff's office said the U.S. Dept. of Defense plans to make an announcement around 3:30 p.m. Thursday. Oliveira, an 11-year member with the sheriff's office, is the 140th service member with connections to New Jersey that has died in the wars in Afghanistan and Iraq, according to statistics compiled by The Star-Ledger. Outside Oliveira's family home Thursday afternoon on Darcy Street in Newark's Ironbound neighborhood, sheriff's officers surrounded the block as Fontoura met with friends and relatives inside. A National Guard officer paced in front of the home, wiping his eyes. The officer said he could not talk about the death. As Fontoura left the house, he called Oliveira a "great guy." "He loved this department," he said. "He showed up every day for work and he loved what he did." The sheriff said Oliveira's family was too distraught to speak with this reporter. Meanwhile, at an unrelated press event Thursday morning in Newark's Branch Brook Park, Essex County Executive Joseph DiVincenzo Jr. said Oliveira defined the role of a sheriff's officer and a guardsman, "Anytime he had the opportunity to go over there and serve and protect us all, he signed up." Word of Oliveira's death quickly spread Wednesday into Thursday on the social networking sites Twitter and Facebook. Newark Mayor Cory Booker said via Twitter late Wednesday night that his "heart aches" and that his "prayers are with (the) family." The New Jersey State Patrolmen's Benevolent Association posted a photo on the organization's Facebook page around 11 a.m. Thursday of Oliveira in his National Guard uniform. Shortly after, more than 50 comments poured in about the officer — most said, "Rest in peace." One comment, by Carol Piscitelli, called Oliveira an "American hero." — Jorge Oliveira arrived in the Ironbound from a town in northern Portugal when he was 7, the son of immigrants who spoke no English. He was buried today on a hilltop in North Arlington, on a bluff that overlooks the New York City skyline on one side, and Newark, the city Jorge Oliveira, called home, and served, on the other. On that hilltop, his parents, Manuel and Armanda, were presented the honorary evidence of their son’s complete assimilation into their new country. The Purple Heart, a military medal that dates back to George Washington. A Bronze Star. An American flag folded in a tight triangle by the six soldiers who carried his casket. A retired No. 1 badge from the Essex Sheriff’s department. His mother accepted these, all while crying out to her dead son in Portuguese. The large contingent of Ironbound mourners understood the words, and tears streamed down the faces of men and women alike. "I don’t want to leave you here, son … I don’t want to leave you," Armanda cried, over and over, as a few hundred uniformed men and women streamed past her son’s silver casket, offering a final salute to a fallen comrade. A soldier’s honor. A mother’s grief. These are the recurring themes of the military funerals for all time, most recently in the decade since 9/11. New Jersey Army National Guard Staff Sgt. Jorge Oliveira’s final resting place is in a special section of the Holy Cross cemetery. He is there, in the shadow of a new 9/11 memorial of a brushed aluminum frame and a fiery cross, among World Trade Center victims and service members who died in the ensuing wars. Oliveira lost his life last week in Afghanistan.Oliveira’s funeral was a Newark day of mourning. He grew up in the Ironbound, went to Ann Street School, East Side High and Essex County College. He worked as a busboy at the Mediterranean Manor because he could walk there from his house. He went into the Army in 1997, then went into the New Jersey Army National Guard and got a job with the Essex County Sheriff’s Office. He did so well on the civil service law enforcement exam that he got offers from five communities right away. He passed, waiting for something with the Newark PD or the Essex sheriff. "The kid wanted to serve his community," said Essex County Sheriff Armando Fontoura, himself a Portuguese-American. "That’s all he ever wanted, to be an American, and to be part this community. His mother said he learned the language in six months." This was Fontoura’s theme as he eulogized Oliveira, 33, before the funeral Mass at Cathedral Basilica of the Sacred Heart. Good son. Good soldier. Outstanding cop. Great American. And a Newark kid, all the way. On a procession that began at the Buyus Funeral Home, Oliveira was saluted by his city, county, state, and country. A hundred motorcycles led the motorcade past his house in the Ironbound and down Ferry Street, where clusters of people waved American and Portuguese flags. At the cathedral, 2,500 fellow officers and military people awaited in formation. In the motorcade was a Humvee driven by Army Spc. Jose Miranda, a North Ward kid, who enlisted with Oliveira and went to war with him in Iraq, one of Oliveira’s three battle tours. "He was a leader. Always smiling. Nothing ever got him down," Miranda said, doing his best to be soldier stoic. "He led by example, and I looked up to him, even though I was older." The sheriff’s office liaison for the family was Helena Oliveira, who is no relation, but was a classmate of Jorge’s at the police academy. "I was H. Oliveira and he was J., so we always sat right next to each other." More than 2,500 people including thousands of police and servicemen paid their respects to Staff Sgt. 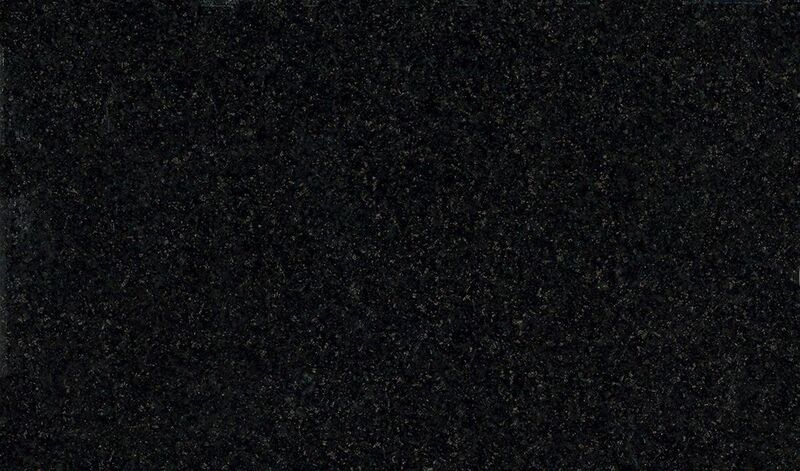 Jorge Oliveira on Friday. The Newark resident and Essex County Sheriffs officer was killed last week on a tour of duty in Afghanistan with the with the New Jersey Army Guard. She, too, tried her best to remain composed, but she finally let some tears escape during the final salute. "I thought I could make it …" she said, her voice trailing off. There was a lot of that today. Gov. Chris Christie, who also eulogized Oliveira, spoke about the "ultimate sacrifice." "He … gave … it … all," Christie said, and it was hard to tell if he deliberate for emphasis, or beating back emotion. "This kid had it all," said Undersheriff Kevin Ryan, moments before the casket was carried from funeral home to hearse. "This kid … I can’t even continue," he said as he wiped away tears. On West Market Street, the employees of the county court house lined one side of the street, 700 kids from Essex Vo-Tech lined the other. Many waved American flags. Fontoura, in his car in front of the hearse, started to say something, then pounded the armrest three times. The sheriff was crying for a kid from a different generation, but not much different from him. He was crying for this kid from Portugal who wanted to be an American. "He told his mother, ‘Ma, this country has given us so much, I got to give something back’," Fontoura said. That conversation happened a day before he died in Afghanistan. His mother was asking whether he was coming home for Christmas. Oliveira told her he switched leave with a soldier who had small children at home. That man would be home for Christmas, he told his mother.